^ Worthy, T.; Mitri, M.; Handley, W.; Lee, M.; Anderson, A.; Sand, C. (2016). “Osteology supports a steam-galliform affinity for the giant extinct flightless birds Sylviornis neocaledoniae (Sylviornithidae, Galloanseres)”. PLOS ONE 11 (3): e0150871. doi:10.1371/journal.pone.0150871. PMC: 4814122. PMID 27027304. https://www.ncbi.nlm.nih.gov/pmc/articles/PMC4814122/. ^ Worthy, T. H.; Mitri, M.; Handley, W. D.; Lee, M. S. Y.; Anderson, A.; Sand, C. (2016-03-30). “Osteology Supports a Stem-Galliform Affinity for the Giant Extinct Flightless Bird Sylviornis neocaledoniae (Sylviornithidae, Galloanseres)”. PLOS ONE 11 (3): e0150871. doi:10.1371/journal.pone.0150871. PMC: 4814122. PMID 27027304. https://www.ncbi.nlm.nih.gov/pmc/articles/PMC4814122/. ^ Murrary, P.F; Vickers-Rich, P. (2004). Magnificent Mihirungs: The Colossal Flightless Birds of the Australian Dreamtime. Indiana University Press. ^ Bourdon, E. (2005). “Osteological evidence for sister group relationship between pseudo-toothed birds (Aves: Odontopterygiformes) and waterfowls (Anseriformes)”. Naturwissenschaften 92 (12): 586–91. doi:10.1007/s00114-005-0047-0. PMID 16240103. ^ Agnolín, F. (2007). “Brontornis burmeisteri Moreno & Mercerat, un Anseriformes (Aves) gigante del Mioceno Medio de Patagonia, Argentina.”. Revista del Museo Argentino de Ciencias Naturales 9: 15–25. doi:10.22179/revmacn.9.361. ^ Livezey, B.C. ; Zusi, R.L. (2007). “Higher-order phylogeny of modern birds (Theropoda, Aves: Neornithes) based on comparative anatomy. II. Analysis and discussion”. The Science of Nature 149 (1): 1–95. doi:10.1111/j.1096-3642.2006.00293.x. PMC: 2517308. PMID 18784798. https://www.ncbi.nlm.nih.gov/pmc/articles/PMC2517308/. ^ Agnolín, F.L. ; Egli, F.B. ; Chatterjee, S.; Marsà, J.A.G (2017). “Vegaviidae, a new clade of southern diving birds that survived the K/T boundary”. The Science of Nature 104 (87): 87. doi:10.1007/s00114-017-1508-y. PMID 28988276. ^ Worthy, T.H. ; Degrange, F.J.; Handley, W.D. ; Lee, M.S.Y. (2017). “The evolution of giant flightless birds and novel phylogenetic relationships for extinct fowl (Aves, Galloanseres)”. Royal Society Open Science 11. doi:10.1098/rsos.170975. http://rsos.royalsocietypublishing.org/content/4/10/170975. Field, J. H.; Boles, W. E. (1998). “Genyornis newtoni and Dromaius novaehollandiae at 30,000 b.p. in central northern New South Wales”. Alcheringa 22 (2): 177–188. doi:10.1080/03115519808619199. Murray, P. F.; Megirian, D. (1998). “The skull of dromornithid birds: anatomical evidence for their relationship to Anseriformes (Dromornithidae, Anseriformes)”. Records of the South Australian Museum 31: 51–97. Miller, G. H.; Magee, J. W.; Johnson, B. J.; Fogel, M. L.; Spooner, N. A.; McCulloch, M. T.; Ayliffe, L. K. (1999). “Pleistocene extinction of Genyornis newtoni: human impact on Australian megafauna”. Science 283 (5399): 205–208. doi:10.1126/science.283.5399.205. PMID 9880249. Rich, P (1979). 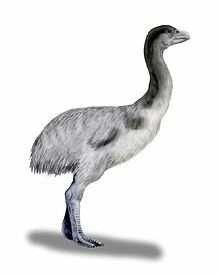 “The Dromornithidae, an extinct family of large ground birds endemic to Australia”. Bulletin of the Bureau of Mineral Resources, Geology and Geophysics 184: 1–190. Rich, P.; Gill, E. (1976). “Possible dromornithid footprints from Pleistocene dune sands of southern Victoria, Australia”. Emu 76 (4): 221–223. doi:10.1071/mu9760221. Rich, P.; Green, R. H. (1974). “Footprints of birds at South Mt Cameron, Tasmania”. Emu 74 (4): 245–248. doi:10.1071/mu974245. Roberts, R. G.; Flannery, T. F.; Ayliffe, L. A.; Yoshida, H.; Olley, J. M.; Prideaux, G. J.; Laslett, G. M.; Baynes, A. et al. (2001). “New ages for the last Australian megafauna: continent-wide extinction about 46,000 years ago”. Science 292 (5523): 1888–1892. doi:10.1126/science.1060264. PMID 11397939. Vickers-Rich, P.; Molnar, R. E. (1996). “The foot of a bird from the Eocene Redbank Plains Formation of Queensland, Australia”. Alcheringa 20: 21–29. doi:10.1080/03115519608619220. Williams, D. L. G. (1981). “Genyornis eggshell (Dromornithidae; Aves) from the Late Pleistocene of South Australia”. Alcheringa 5 (2): 133–140. doi:10.1080/03115518108565426. Williams, D. L. G.; Vickers-Rich, P. (1992). “Giant fossil egg fragment from the Tertiary of Australia”. Contributions to Science, Natural History Museum of Los Angeles County 36: 375–378.